(See larger image here.) 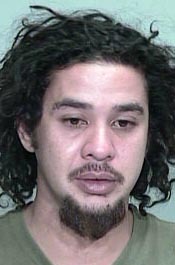 Frank Ng Jr.
Big Island police are renewing their request for the public’s help in locating a 28-year-old Kamuela man. Frank Ng Jr. of Kamuela was reported missing on February 13. He is described as Hawaiian, 5-foot-8, about 175 pounds with brown hair and brown eyes. He has a tattoo on his left forearm and another on his back. Police received an unconfirmed report that Ng may be on Maui. They ask anyone with information on Ng’s whereabouts to call Detective Kenneth Quiocho at 326-4646, extension 281, or the Hawaii Police Department’s non-emergency line at 935-3311. Tipsters who prefer to remain anonymous may call Crime Stoppers at 961-8300 in Hilo or 329-8181 in Kona. All Crime Stoppers information is kept confidential.